We feel privileged to be a part of the RSPA and grateful for the recognition and continued support from the resellers. APG is committed to supporting the reseller channel and the point of sale industry. 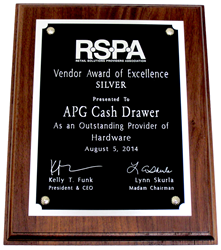 APG Cash Drawer, LLC., worldwide manufacturer of mobile cash drawer solutions and other POS related products, was recently awarded the Silver Vendor Award of Excellence for Outstanding Provider of Hardware. The award was given during the annual RSPA Awards of Excellence reception at RSPA’s RetailNOW 2014 conference in Orlando, FL. This is the seventh RSPA award in eight years for APG in the Outstanding Hardware category. The RSPA (Retail Solution Providers Association) is a renowned industry organization that supports VAR and dealer professionals in the retail technology industry. Focusing on new business trends, emerging technologies and best business practices, RSPA is a valuable resource for all members of the POS industry. APG has been a member of the RSPA since its inception in 2005. Prior to 2005 APG was involved with the SDA and ICRDA, the founding organizations of the RSPA. The RetailNOW 2014 show hosted over 180 booths featuring the latest products in the retail technology industry. At the show, APG showcased their new Stratis Integration System and new line of all-white cash drawers. APG’s V.P. of Global Marketing, Stephen Bergeron, also presented at the conference. To view the presentation, “Emerging Cash Management Trends,” click here. About APG Cash Drawer, LLC - APG manufactures a broad range of high-quality cash drawers and other related products for thousands of customers throughout the world. During its 35+ year history, APG has built a reputation as the supplier of choice for highly durable and dependable cash drawers. To discover more about APG and other APG products, visit http://www.cashdrawer.com or call us at 763-571-5000.